The canna-economy has some core problems. Until they are solved, the industry will not reach the extraordinary potential predicted of its revenues and tax payoffs. Recreational cannabis remains illegal in most states. Banks and investors fear Federal restriction on these financial transactions. And, states have imposed demanding seed-to-sale tracking reports. Few new businesses face such challenges. 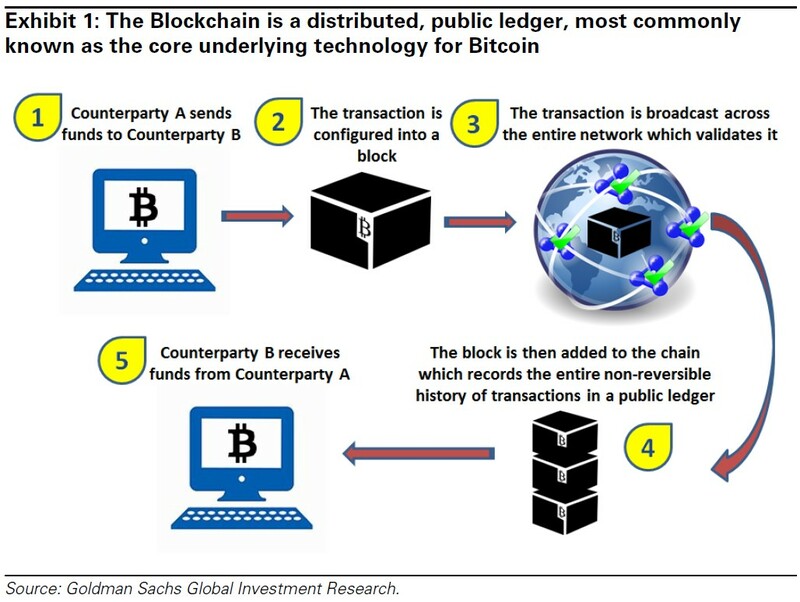 Blockchain technology, sometimes referred to as distributed ledger technology, challenges the average explanation. The origin of blockchain technology is attributed to Kelce Wilson, Ph.D., Stuart Haber, Ph.D., and W. Scott Stornetta, Ph.D. But, it was made operational in 2008 by the mysterious Satoshi Nakamoto. That’s the name of either a person or a group of people behind Bitcoin. The National Security Agency and Department of Homeland Security claim to have identified who Satoshi Nakamoto is, but will not disclose the name. At its simplest, you could use the money you deposited in a cryptocurrency blockchain, like Bitcoin, to buy a pizza online or pay other bills. The advantage to the average person would be convenience and security while the vendor received your payment immediately in real-time. But, blockchain isn’t that simple anymore. The blockchain exists independently of third-party oversight. Without banks, credit card processors and check transactions, the vendor saves on the cost of doing business. And, for the cannabis industry that means a new way to do business where they cannot do business with banks or through credit card services. All businesses want privacy and security. But, legacy banks no longer guarantee either. The largest commercial banks have been repeatedly hacked with the identities and data of hundreds of thousands of business customers stolen or compromised. Authoritative agencies and courts could demand access to those banked business records. And, they could be attached or frozen by several authorized forces. But, the blockchain does not facilitate this. Transactions occur between keys owned by customer and vendor, each identified by a key. The owners verify the transaction and reject double spending. Transactions are timestamped and publicized to other blockchain participants with a proof of work. What this process also offers is the database for tracking cannabis movements from seed through cultivation processing distribution and sale. And, it does it in real-time, so cannabis owners can run the daily reports required of them in some states. In addition to the tracking of product and transactions, it also creates a valuable cannabis database that can be studied for marketing patterns and behavioral analytics. Coincidental with the process tracking is the ability to harness all parties on the cannabis business supply chain. 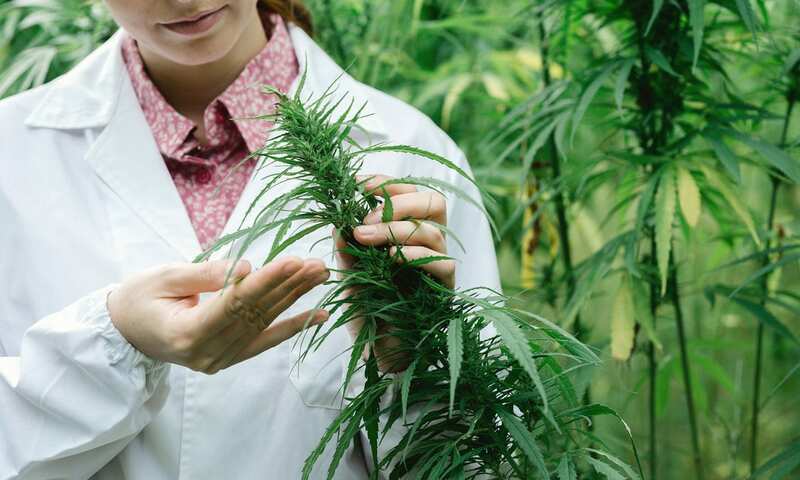 The cannabis business has transactions between customer and store, but it also has financial transactions with breeders, seeders, processors, packagers, delivery services and more. These connections are dynamic throughout the day, month and year. Some cluster on the calendar, and others repeat regularly. But, everyone wants their transaction completed quickly in their own cash flow and investment interests. 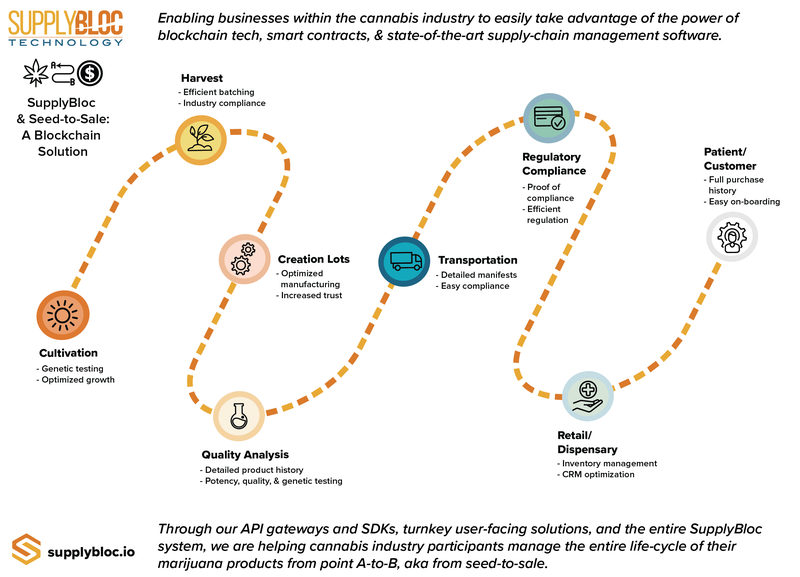 As described in New Cannabis Ventures, “This enables equal visibility of activities and reveals where an asset/product is at any point in time, who owns it and what condition or state it is in.” Because the data on the blockchain is immutable yet accessible to all willing and authorized parties, each link in the supply chain is fully informed at the most optimum time. 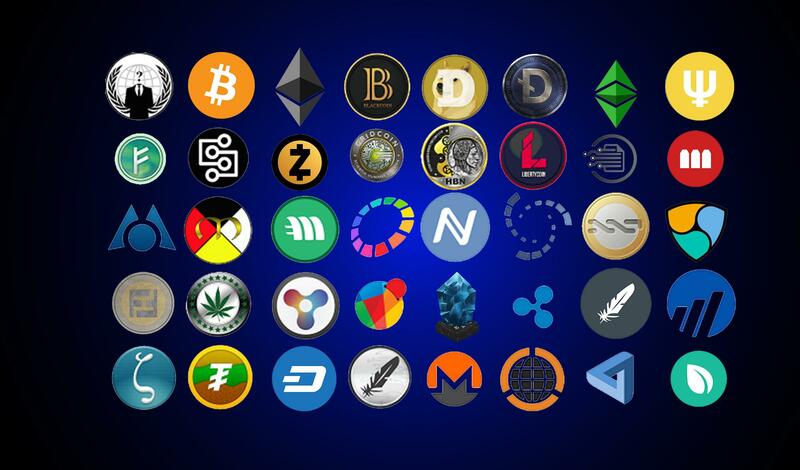 Long associated with cryptocurrency, more industry sectors see the benefit of the technology. It now serves digital sales, advertising, business services, restaurants and other business sectors. No one at the start of the 1900’s could imagine commercial flight, nuclear power or a credit card economy. Blockchain may signal the next generation life and economy changing revolution underway. 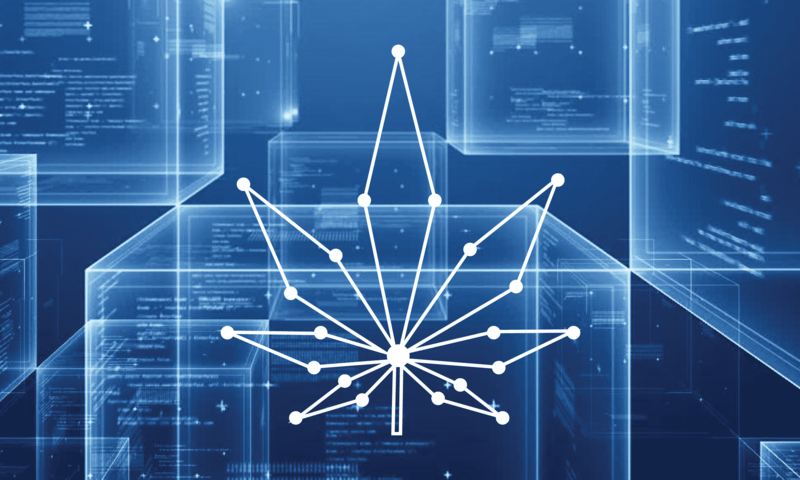 If it started as an idea to facilitate pizza transactions, blockchain technology can certainly solve the challenges facing business at physical and online recreational and medical cannabis dispensaries. IBM, Intel, J.P. Morgan and Bank of America are all working on branded versions of the blockchain. 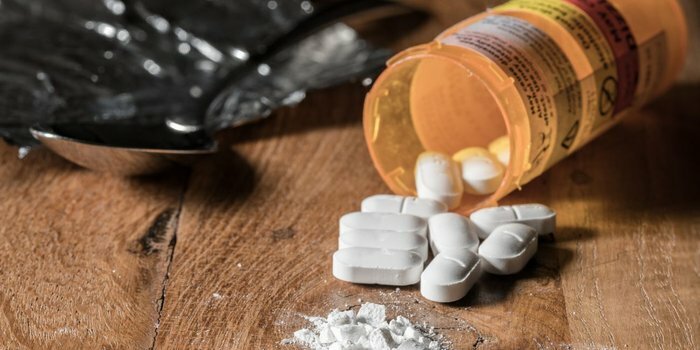 Tokken and CHEX have targeted cannabis businesses. Unfortunately, blockchain technology needs a lot of clarity and support. It has yet to produce a product the average business owner can understand. Owners need a self-explaining, easy to navigate and scalable version, or a trusted advisor to find, install, and manage their solution.